Allen Webster was solid but inefficient. The righty allowed just one run on five hits, but was removed after 5 1/3 innings with 95 pitches in the books. He struck out six and walked two. He was aided by a stellar bullpen trio of Jose Contreras, Chris Martin, and Anthony Carter that allowed just one hit in 3 2/3 shutout innings. It was a tough loss to take for Portland, who fell 9-6 to the Bowie Baysox (BAL). Leading 6-5 headed into the ninth, Bowie scored four times off reliever Matt Maloney. It was by far the toughest outing on the year for Maloney, as he attempts to work his way back from Tommy John surgery. In nine previous outings across two levels, he had given up just one earned run. Only one of the four runs allowed by starting pitcher Jeremy Kehrt was earned, as a crucial error by Heiker Meneses opened the door for a four-run third inning. It was a big night at the plate for Matty Johnson. The right fielder, known more for his speed and defense than his bat, went 4 for 5 with a triple, scoring two runs. Christian Vazquez drove in a pair and Michael Almanzar scored twice as both delivered two-hit performances. J.C. Linares added two hits, while Garin Cecchini was on base twice with a single and a walk. Perhaps the best news of the game was the return of catcher David Ross from a concussion. Ross made his first rehab start since being sidelined on June 14 after taking a hard foul ball off his mask. The effects of the concussion were debilitating, as Ross experienced severe headaches and nausea that prevented him from traveling with the team. Ross went 0 for 2, driving in a run on a ground out. A ninth-inning comeback fell short when the tying run was thrown out at the plate, and Salem lost 3-2 to the Winston-Salem Dash (CWS). Down 3-0 headed into the bottom of the ninth, Keury De La Cruz started the rally with a one-out single. Stefan Welch and David Chester followed with consecutive walks, loading the bases for Mookie Betts. Betts delivered, driving the ball to right. De La Cruz and Welch scored easily, but pinch runner Cody Koback was thrown out at the plate as the potential tying run. Matt Gedman then flew out to center, ending the rally and the game. Mickey Pena made his sixth consecutive quality start, allowing one run on six hits in six innings, while walking two and striking out five. It was another tough-luck loss for Pena, who is 1-3 in his last four starts despite a 2.77 ERA in that time. After an off outing, July's SoxProspects.com Pitcher of the Month Luis Diaz got back on track in Greenville's 7-3 win over the Asheville Tourists (COL). Diaz gave up one run on five hits in seven innings, striking out seven without walking a batter. The 6-foot-3 right-hander lowered his ERA to 2.22 on the season. Since June 25, he is 6-0 with a 0.99 ERA. Kyle Martin allowed two runs (one earned) in his two innings of relief. The offense knocked nine hits, the biggest being a two-run homer by Mario Martinez in the third that gave the Drive a 4-1 lead. It was the eighth homer of the season for Martinez, who had two hits on the night. Sean Coyle, Felix Sanchez, and Dreily Guerrero added doubles, while Reed Gragnani drove in three runs with a single and a pair of sacrifice flies. Lowell managed only two hits, and the Spinners came out on the wrong end of a 1-0 pitcher's duel against the Staten Island Yankees (NYY). Ty Buttrey took the loss for the Spinners, despite a season-high five strikeouts. Buttrey gave up the one run on three hits in four innings and fell to an even 3-3 on the season, while lowering his ERA to 2.61. Simon Mercedes was excellent in relief, firing four innings of one-hit, shutout baseball. Mercedes struck out seven and walked only one. A balanced effort led the GCL Red Sox to a 4-2 win over the GCL Twins. Starter Jake Drehoff, Boston's 12th-round draft pick, had his best professional outing with two no-hit innings. Dioscar Romero was credited with the win in relief, giving up two runs (one earned) in three innings, striking out and walking two apiece. Enfember Martinez, Stephen Williams and Ellis Jimenez combined for four one-hit innings of relief, with Jimenez recording his fifth save. The GCL offense got seven hits from seven different batters. The biggest was a two-run double in the second inning off the bat of Jake Davies. Jordon Austin and Nick Longhi also doubled for the Sox. 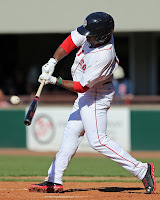 The best pitching performance on a day full of strong pitching came from DSL Red Sox hurler Carlos Garcia. Garcia retired all 18 batters he faced in a 7-1 win over the DSL Astros. The 18-year-old lefty struck out six, moving to 4-3 on the year. Happy to see Garcia go, the Astros ended the perfect game and shutout attempts in the seventh against reliever Algenis Martinez. Martinez allowed only the one run on three hits in his three innings, getting credit for the save. Ricardo Andujar drove in four runs to pace the Sox at the plate. The third baseman had two doubles after recording only one extra-base hit in his previous 24 games. Victor Acosta went 2 for 5 with a double and a pair of RBI, while Luis Alexander Basabe added a pair of hits of his own. Player of the Day: Carlos Garcia was perfect, highlighting the major step forward the left-hander has taken in his second pro season. After struggling to a 1-3 record and 6.23 ERA in 2012, Garcia has a 2.77 ERA and a fantastic 0.96 WHIP in his sophomore season with the DSL Sox. Garcia, signed out of Venezuela, has 46 strikeouts and only 19 walks in 55 1/3 innings.